If Mozilla Firefox is your default browser, you might accidentally install the Shoppr extension on it. This browser extension is classified as adware because it has been created for monetary purposes. When Shoppr gets added to your browser, it starts tracking your online activity. Although a lot of applications and popular websites do that, when this function is employed by an adware program, it raises a few security concerns. You should do everything in your power to avoid potential computer security threats, and that involves removing Shoppr from your PC as well, because if you fail to nip this problem in the bud, you may end up dealing with severe security issues later on. The good thing about this application is that it is created for Mozilla Firefox only, so it cannot affect other browsers. What’s more, the extension obviously does not infect you surreptitiously because it has an official website, and you can even add Shoppr to your browser from getshoppr.com. On the other hand, it is far more likely that you installed it accidentally because such adware applications usually get distributed in software packages. For example, if you download programs from file-sharing sites on a regular basis, it is very likely that sooner rather than later you will encounter a third-party installer that distributes multiple applications. If you are not attentive during the installation process, Shoppr and other unwanted applications will enter your PC. Shoppr offers you the ability to compare prices from thousands of different local dealers – ensuring you’ll always find the lowest price in a store near you. This would suggest that Shoppr also tracks your location so that it could provide you with the aforementioned information. Although the application cannot steal your financial information or your identity, the fact, that Shoppr can keep tabs on your location and other online activity data, is a definitely slightly disturbing. What if this information gets leaked to unreliable third parties? What if these third parties make use of the data to expose you to dangerous websites and harmful content? These are the main security concerns you have to take into account when you deal with Shoppr. It is true that this program cannot infect you with malware, but it might as well become a malware distribution tool if it gets exploited by cyber criminals. In order to avoid such consequences, you have to get rid of this extension right now. 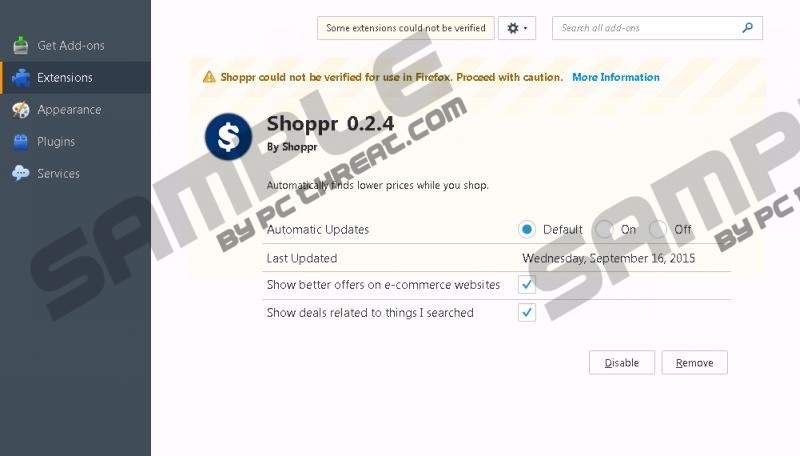 Follow the guide below to delete Shoppr from your browser. To terminate other adware-related files, you should scan your PC with the SpyHunter free scanner. Please remember there might be more unwanted applications on your computer, so a full system scan will help you locate them all. Get rid of the potential security threats ASAP, thus ensuring you will not experience a financial fraud in the future. Disable and remove Shoppr from Extensions. Quick & tested solution for Shoppr removal.